Scientific Classification of Painted Turtle: Chrysemys Picta. Painted Turtle males are smaller than the females. It is recognized as one of the beautiful motley colored species. The males reach sexual maturity much before compared to females. The mating between them takes place in the water. These species usually hibernate during winter. Till now, only 4 sub-species of the painted turtle have been discovered. These species inhabit largely along the coasts from Pacific to the Atlantic. They are also found in about 45 American states and 18 Canadian states. 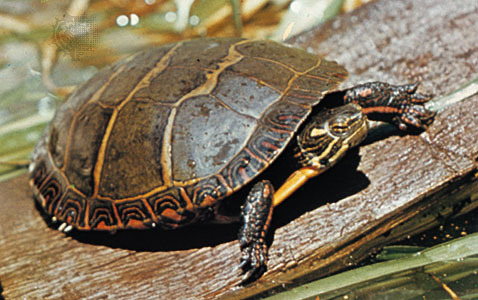 Size of The Painted Turtle: As compared to males, the female counterparts are longer in body size. The females vary between 4 – 10 inches in size, whereas the males are 3 to 6 inches. Shells may also vary. 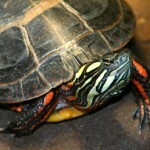 Color of The Painted Turtle: The shells are mostly found in black or olive colors. Infact, the skin also depends on the shell’s color. 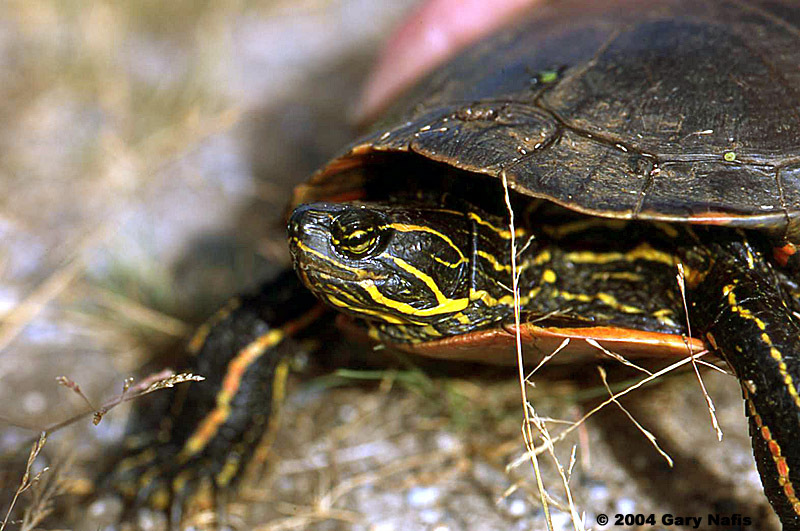 The lower portion of the turtle’s shell is red or yellow in color while the central portion is dark colored. Moreover, the legs, tail and the neck are dotted with red and yellow marks. 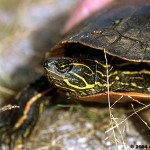 Head of The Painted Turtle: A short neck connects the head to the body. Well these species are devoid of any ears. They have bulging eyes on either side of the face. The nose too is located on the face of the turtle. Body of The Painted Turtle: Beneath the hard external shell of the turtle lies a soft fleshy skin. Limbs of The Painted Turtle: These species have webbed limbs. Well, these species are essentially omnivorous in nature. Therefore, they primarily feed on both living & dead animals. However, the food habits of the sub species are quite different. Descripton of some of those habits are discussed below. Eastern painted turtle likes to feed on dead or injured fishes. Western painted turtle prefer to have plants and animals in their diet. 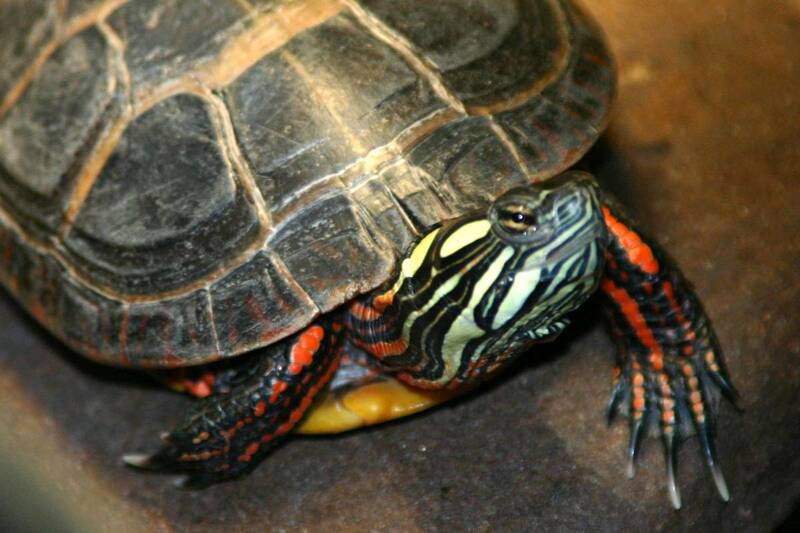 While the midland painted turtle thrives on non-vascular and vascular insects. 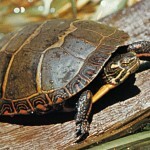 The southern painted turtle have both plants and animals. The younger ones feed on animals while the elder ones like plants. The sub species feed on plants, animals or insects in their diet. They like to mate in the profound bottoms of water bodies. When they sense something strange, they hide themselves within their tough shells. These species can survive for long months without external oxygen. Similar to other reptiles, they also hibernate. These species like to dwell in fresh water. They are also found in ponds, lakes and marshy areas. These species hibernate during the winter months. They usually do so, on sea shores or of other water areas. They can often be found hibernating in the woodlands and forest close to the proximity of the water areas. The color of these species helps them to camouflage in danger. These species move very slowly. Neither their predator nor the prey gets any hint of their presence. Last but not the least these species are not harmful at all. These species usually mate from mid of April to end of July. As compared to females, males have longer claws. The males touch the cheeks of their partners to express their love. When both them are prepared to mate they swim into the bottom of water bodies. The females usually lay 4 to 20 eggs in open areas. Post hatching, the off springs rest in the yolks of the egg itself. The younger ones grow rapidly. Infact the development of the females are faster than that of the males. In case of the painted turtle, the males reach their sexual maturity between 2 to 4 years while females between 6 to 10 years. These species usually survive for an average of 20 years. Laws to Be Followed: The animal protection Laws prohibits the petting of the painted turtle. It is necessary to adhere to the laws and also get proper permissions if one desires to do so. Housing Necessary: Proper quantity of water should be given along with a provision for basking. At the same time, the water needs to be changed on a daily basis. Proper Temperature: The temperature of the water should be maintained above 30 degree Celsius. Proper Foods: The food totally depends on the sub species one is petting. One should provide them with vitamin supplements too to complement the nutrients of the food. According to IUCN, these species are in the category of least important ones in the endangered list. They conservation status is perfectly okay.